Life is short. It’s going to end one day. Those who accept the mortality of life can value it in a better way; meanwhile, others who spend their life in fear of death, can never have a peace of mind. Here we have handpicked some of the best quotes about mortality to share different views of different people about it. Hope you will find some inspiration for bringing your life on the right track and not take it for granted. Knowing that you are mortal will ease your terror of death. Mortality gives meaning and value to the days granted to us. Avail this one chance you are given, before you move on. Life is a disease and the cure is mortality. 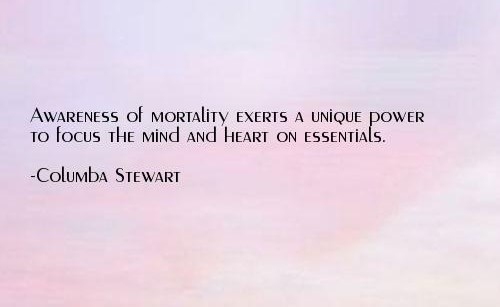 Awareness of mortality gives us better understanding of the essentials of life. Mortality lies right next to these layers of illusion. Fear of death keeps haunting me. Mortality means things are going to end one day. There is nothing you can do about your mortality. So stop living in fear. Yes! Live each day as a gift and blessing of God. Illness is a reminder of our fragile mortality. The purpose is to create something that lives forever. Seeing others die should be taken as a warning of our mortality. That may be true but we can make our lives more meaningful. We should never forget that life is going to end one day. Mortality reminds us of our brief life on earth. We understand more about mortality with age. A mature way of finding joy. When you know the limitations of life, you live it well. Let's hope these quotes about mortality make you learn to get the most out of life. Server responsed at: 04/21/2019 10:42 p.m.